About: Anderson Regional Health System is the most comprehensive health system in the East Mississippi/West Alabama area. The health system is ranked in the top 2% in the nation for patient safety and experience by Healthgrades, a leading independent healthcare ratings organization. Challenge: During a transition in leadership, Anderson Regional analyzed their revenue cycle processes and identified areas for improvement. Key financial metrics showed that calculated A/R days were in excess of 95 days while there was also $7 million in credit balances across more than 7,000 patient accounts. The hospital recognized that a lack of standard workflow processes was leading to inefficiencies in the revenue cycle department. Issues such as manual communication methods and over-reliance on paper needed to be corrected in order to revamp Anderson’s revenue cycle efforts. Execution: An important component of Anderson’s success was their migration from MEDITECH’s MAGIC platform to the 6.1 solution. They were determined to maximize their use of all the tools their Revenue Cycle solution had to offer and ensure staff was adept at navigating the system. Using the power of the Financial Status Desktop allowed the revenue cycle team to continuously monitor the organization’s financial health and make more informed decisions relative to overall performance. By using real‐time financial data to actively monitor key performance indicators, Anderson quickly identified negative trends and became proactive in reversing them. 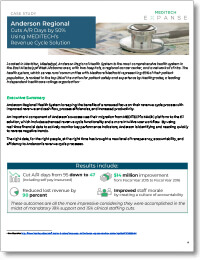 Download this full case study and see what our Revenue Cycle technology can do for you.